The Short Selling Home Study will provide you with key insights on how to short sell successfully. We have put together a comprehensive program that focuses on the two major chart patterns that occur with short selling candidates and teach you how to short the right way. 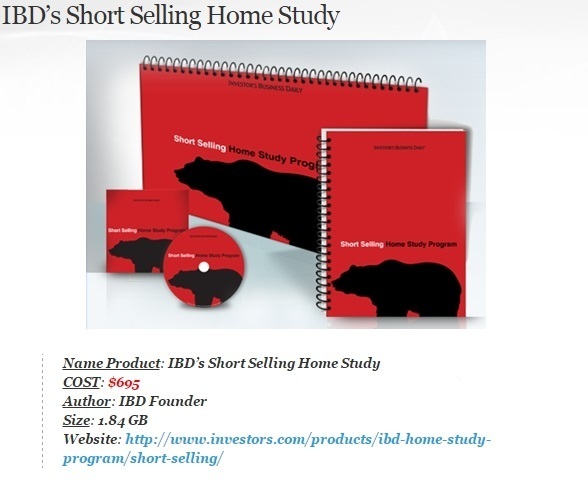 After much research and anlaysis, IBD has developed this Short Selling Home Study to provide you with key insights on how to short sell successfully. This comprehensive program focuses on the two major chart patterns that occur with short selling candidates. The chart examples were hand-selected by IBD Founder and Chairman, William J. O’Neil, whose personal notes appear on each chart. Once you learn how to short the right way, it will be an skill you can use over and over again. Chart examples hand selected and annotated by IBD Founder and Chairman, William J. O’Neil. The examples span decades to show you how these chart patterns happen in every market cycle. Once you learn how to short the right way, it will be an skill you can use over and over again. A comprehensive program that focuses on the two major chart patterns that occur with short selling candidates. The workbooks teach you the fundamentals of how and when to short. The materials cover shorting guidelines, strategies and portfolio management techniques that will help you short stocks successfully.